We checked into the Alt Hotel and immediately felt inspired by its relaxed nature. The ease of check-in, the airy feel to its spaces, the convenience of everything in the room, topped off by the impeccable view - we couldn't help but slow down a little. Once we made ourselves cozy in our harbour view room for the night, we made a pretty big decision - we're not leaving! So, we called for pizza delivery and put on our comfy outfits for the night. Thanks to Skip the Dishes finally making their way to St.John's, getting delicious food delivered is now all too easy. If you follow our Instagram stories, you'll know we already spend too much time at Piatto, so naturally, we got some delivered to our room at the Alt Hotel. Sitting around in loungewear, chatting and laughing with my best friend on a big comfy bed, and watching a boat dock in the harbour while sipping a glass of wine is now one of my top memories. This was one of the times I've felt the most relaxed and most treated - and all I needed was a room at the Alt Hotel to set that off. We ordered our two favourite pizzas from Piatto, the Dolce e Fumoso and the Americana and ate them both as the sun set. We lazed around finishing our bottle of wine, flicking through the TV channels and continuously having bouts of awe at the view throughout the evening. Finally, we hit the button to close the automatic blinds and fell asleep in the plush bed. We awoke as the sun started creeping around the edge of the blinds - and we're glad this is what woke us up. Again, we hit the button and this time the drapes rose to reveal a bright sunny day and the glistening harbour view. At the Alt Hotel, they serve up a continental breakfast of delicious pastries from the local Rocket Bakery & Coffee Bar. If you've never been, you need to try their almond croissants! We slipped our shoes on and snuck down to the lobby with our fingers crossed there would be some left - and there was! Coffees and pastries in hand, we set back to our rooms to bask in the glow of a sunny morning through our floor to ceiling window. The best feature of the Alt Hotel (yes, better than the view) is that they have NO CHECK OUT TIME. This means, we could relax with our coffees, watch that boat unhook from the dock, and we even took some time to relax further with some face masks. Feeling fresh faced, rested and absolutely pampered, we set out to enjoy our day in downtown St.John's. 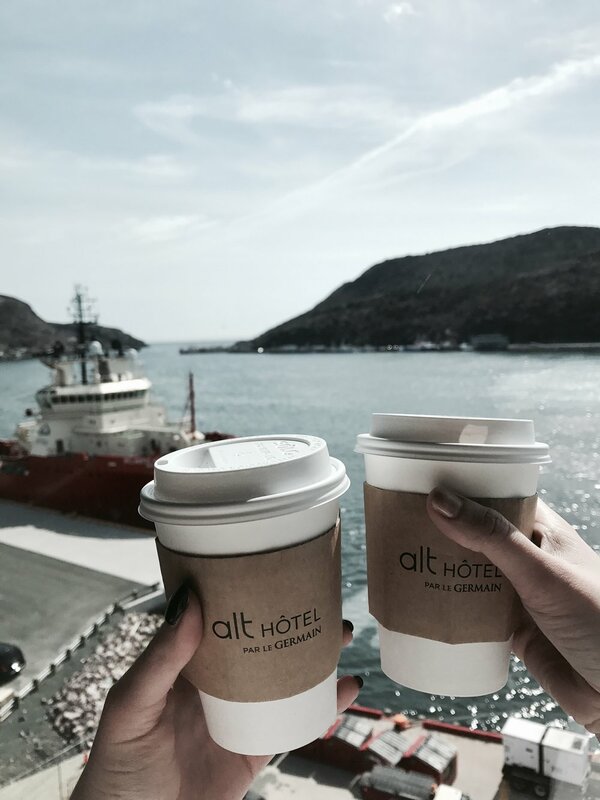 Our experience at the Alt Hotel was definitely the alternative to what we've previously experienced travelling, and at their affordable prices, we are going to be making a return trip.